Local tradesman, Steve Green of 24/7 Electrical Contractors Ltd, made the move to Edenbridge several years ago after deciding to leave London and start up his own business here. 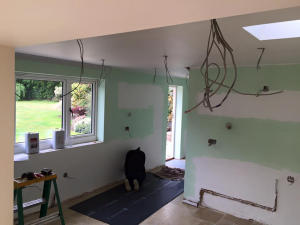 Following a successful career working for large construction companies as an electrical estimator, Steve wanted to move away from all that to work more locally and Edenbridge, with it’s good connections to the South East and near where his partner Gemma grew up, was the ideal location to not only grow his business but also his family. 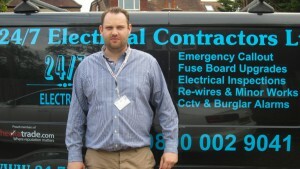 Originally starting out as a one-man-band, Steve now employs a team of electricians covering not just Edenbridge and Kent but Sussex and Surrey too! 24/7 Electrical provide services to both domestic and commercial clients and the company adhere to all the necessary industry regulations. He and his team are fully certified so you can be rest assured for a professional service if you book them in. All 24/7 employees are CRB checked as well as Kent Trading Standards Approved for your peace of mind. They are also able to undertake work for commercial clients and already hold contracts with care homes, shops and offices who pay a monthly fee for regular servicing and maintenance of their buildings in order that they are compliant. The 24/7 team are experts in their field and when working on larger projects they will use their expertise to come up with ways to help their customers save money. When it comes to carrying out electrical inspections, the 24/7 team use the latest iPad software and certifications can be produced and emailed the same day they are carried out. 24/7 Electrical also provide a 24hr Emergency Service and are the major contractor for the local area in providing emergency electrical services. Their rapid response emergency electrician will get to your premises as quickly as possible to repair, rewire or replace whatever it is that presents a danger. For all your electrical requirements!